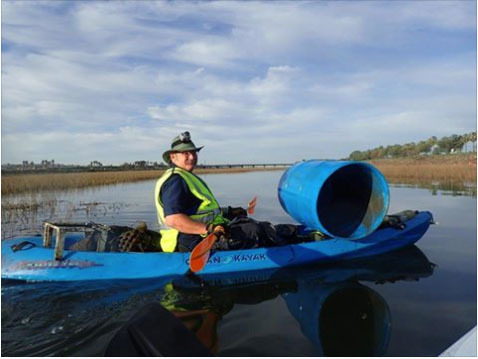 Once a year, the San Diego River Park Foundation gets special permission to enter the San Diego River Estuary on kayaks and pull trash out of the water in this sensitive habitat. This is a unique opportunity to see the San Diego River from a new angle while helping out! The San Diego River Estuary is a critically important 330-acre wildlife area with habitat for many sensitive species, including endangered birds that nest in the estuary, like the Ridgway’s Rail and the California Least Tern. Over 100 different species of birds use this area as a rest area along the Pacific Flyway during their yearly migrations between Alaska and Mexico. Thanks to the support from Aqua Adventures, we will have kayaks available for volunteers to borrow, but you are welcome to bring your own. Kayaks will be sent out in two shifts: 9a-10:30a and 10:30a-12p. While boats are in the water, shore volunteers will remove trash along the banks of the estuary and the adjacent San Diego River Trail.